Jaxon Confirms Copper Gold Porphyry Discovery at Red Springs; Assays Pending | Jaxon Mining Inc. 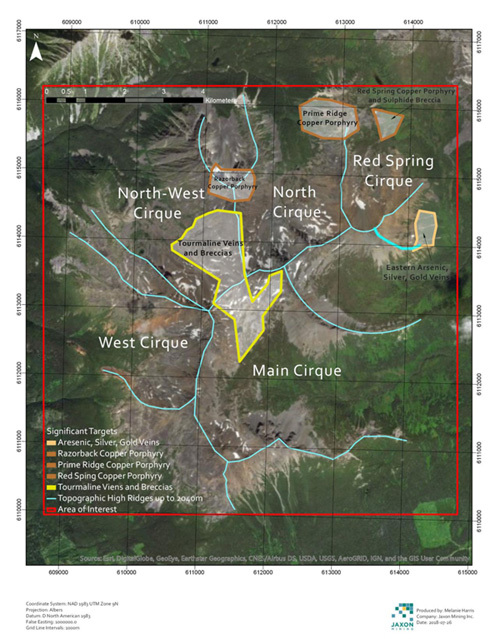 The first phase of exploration at Jaxon’s Red Spring discovery, 40km north of Smithers, BC, commenced on June 1, 2018. The Red Spring target resulted from the significant discovery made last summer of high-grade gold and tellurium-bearing hydrothermal tourmaline breccias detailed in Jaxon’s press releases of September 14, 2017 and February 20 and May 16, 2018. The project lies within the greater Hazelton project area, which covers more than 39,000ha and includes Jaxon’s Max volcanogenic massive sulphide project. More than 150 individual occurrences of mineralisation located of various styles attest to a significant porphyry system within the project area. Geological mapping and surface sampling nearing completion on 36km2 area of interest. This first phase of fieldwork included geological mapping and sampling over a 36km2 area of interest, Red Spring, located within the Hazelton Property (fig.1). In addition to the rock sampling program, a total of 30 stream sediment samples have been taken to identify prospective areas on a semi-regional scale. Jaxon is highly encouraged by the new discovery of five major mineralised trends within the Red Spring project area, four of which have been defined within six weeks of commencement of the field season. More significantly, the results validate the exploration team’s initial interpretation that the gold-tourmaline-breccia discoveries are related to a large porphyry copper system with the definitive discovery of three zones of porphyry copper mineralisation to date. The distribution of this mineralisation which broadly occupies a 5km x 2km corridor generally aligned around a NE-SW trending major structure and tending to concentrate around the Main and Red Spring Cirques. The extent, style and distribution of these mineral occurrences is consistent with an association with a large porphyry system that Jaxon had previously hypothesised and has subsequently demonstrated with the discovery of three currently separate areas of porphyry copper mineralisation. The location of these prospects is shown on figure 1. The Phase 1 surface sampling program will be completed by the end of July and all assays are expected to be received by mid-August. The company will report on the complete data set of rock and stream sediment results at that time. As previously reported, Simcoe GeoScience has been retained to use its experience in the Golden Triangle to complete a detailed ground magnetometer survey and time domain IP (induced polarization)/resistivity survey. This program is designed to evaluate the depth of tourmaline breccia bodies and outline their associated intrusive centres with developed porphyry systems. The grid design has been extended and modified from the original survey plan to bias the coverage of the newly discovered 2018 mineralisation. Jaxon will utilize the expertise and interpretation products of Simcoe GeoScience in conjunction with its detailed mapping and sampling of the exposed sulphide occurrences in preparation for a fall drilling campaign. Prospecting samples were collected in the field by experienced, professional prospectors and geological staff who selected hand samples from outcrop, chip samples, boulder and talus debris samples suitable for slabbing by rock saw. The samples were numbered, described and located in the field for follow-up. Numbered rock samples tags were placed inside each bag which was securely closed for transport to Jaxon’s secure cold storage locked facility in Smithers, BC. Representative sample slabs were cut from large specimens and halved rock samples so that portions of select samples could be saved for the Jaxon’s rock library, descriptive purposes and petrographic study. MS Analytical of Langley B.C. received the Rice Bag shipments after secure transport from Smithers and they prepared the samples by crushing, grinding and pulverizing to a pulp with barren material washing between each sample at the crush and pulverizing stages. Then 20 g of pulp was used for the (IMS-117 code) ultra trace level ICP/MS AR digestion method, and four acid 0.2 g ore grade ICP – AES method (ICP-240) and for the overlimit gold the FAS-415 method of 30 g fusion Gravimetric method was used to report gold ASSAYS. Overlimit silver is determined by Fire ASSAY 415 method. Laboratory standards and QA – QC is monitored by Jaxon.